Foto aus "BMW Einzylinder richtig angefasst" (S. 154 Bild 15) von Ernst "Klacks"Leverkus. Einer von drei Prototypen der R 28. Als Kundenkreis waren hauptsächlich Behörden angepeilt. Es gab 3 verschiedene Prototyp-Ausführungen: R28a mit Langarm-Vorderradschwinge, R28b mit Kurzarm-Vorderrad­schwinge und die R28c mit Telegabel, wie sie später in den großen /5 Modellen verbaut wurde. Das Projekt wurde dann aber gestoppt, weil niemand mehr Einzylinder haben wollte. 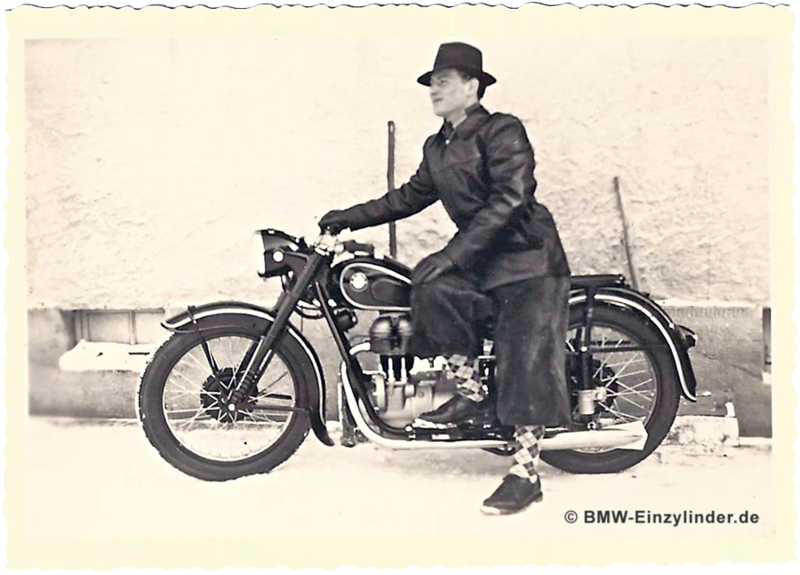 Zitat: The BMW R28 is a development of the production touring motorcycle model R27 for the requirements of the Defense Ministry, Frontier Guards and Cross Country sports enthusiasts. I understand that all vehicle specifications for the Military were achieved except for the weight and it appears likely that BMW was not prepared to design a totally new motorcycle without guarantees of getting the order from the authorities. Several versions of the R27 were also tested with normal Earles Forks, modified Earles Forks and with telescopic forks. Some of the spec. required: Frame with rear wheel suspension; Telescopic fork; Cross country tyres; Suitably large fuel tank; Seating for 1 - 2 persons; Sturdy sump guard; Oil moistened air filter (oil bath? ); Brackets for two panniers; Holder for dispatches; High level exhaust system (Note the photo shows a low level system fitted). Front wheel suspension Telescopic forks (developed from BMW R25/3) with hydraulic damping and travel of 126 mm.